Fashion Architect: Under-served makes you feel undeserving? A young man in New York entered luxury department store Barneys and bought a Ferragamo belt, paying with his debit card, ID and all. Upon exiting the store, he was stopped by two undercover NYPD officers, who handcuffed him and took him into custody for about 2 hours. The store clerk had called the police to report that the card "must be" stolen. Why? Because he was a black young man, trying to spend his money in expensive fashion, and that looked suspicious. He was released after his card turned out fine, returned the belt at Barneys vowing never to shop there again and filed a big fat law-suit. It wasn't too long ago that we were equally disgusted by the Oprah incident in Switzerland, when a luxury handbag store clerk refused to let her see a specific bag she asked for, because "she couldn't possibly afford it". And of course, I couldn't possibly write all this, without a mention to the Pretty Woman classic shopping scene. Now, if I want to speak for more familiar situations, then I have to tell you that in Athens, Greece there's even no need for racial prejudice to be involved. We can all rely on Kolonaki salesgirls to make us feel like rubbish. For non-Greeks reading this, Kolonaki is the luxury shopping district with the most obnoxious sales people ever to click their heels on shiny boutique marble floors. I've heard numerous stories from friends and acquaintances that would make Vivian Ward's skin crawl. And not just in Kolonaki or high-end stores. I've been given the "you don't deserve to be here" attitude in a Fornarina shop in the suburbs. And I even bought a belt from them that day. Funny coincidence, no? However, what I discovered once, during a super-secret mission at the Gucci boutique in Kolonaki that turned into an experiment, is that if you have an attitude blasting "I'm not fooling around here" right from the begining, chances are no-one will doubt you. For those of you who don't remember this post, back in December 2009 I was working as an architect renovating a boutique in Athens, and my client had asked me to find out the proper size of a luxury store's fitting rooms. Basically, he literally told me "go into a boutique in Kolonaki and measure the damn thing" so I did. Of course, I couldn't just march in and say "hi, can I measure your fitting room" so instead I entered Gucci with the attitude of a shipping dynasty heiress and asked for "a little something to wear at a wedding". That "little something" was a crystal-covered drapé dress worth about 4,000€. 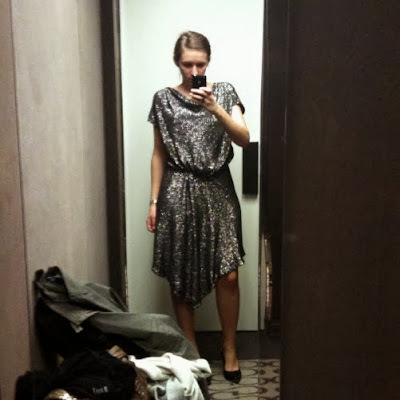 I tried it on, took a pic, measured the fitting room and exited, mumbling to the shopping assistant "hmm, I guess that looks nice enough, I'll come back along with my mother, as this is a family wedding" in my best nonchalant tone - like I do this all the time, daaaahling - and left. It was revelating how different the shop assistant's initial approach changed, as soon as she realised I had an attitude bigger than hers. So, now that I've shared my own share, it's your turn. In Greece or abroad, in an expensive or not too expensive store, has bad service ever made you feel you didn't deserve to shop there? In other words, have you ever had a "pretty woman moment" in real life? Σε εμένα προσωπικά δεν έχει τύχει, ή τουλαχιστον δεν το θυμαμαι. Αλλα εχει τυχει σε μαμαδες φιλων μου με περιττα κιλακια να μπουν σε μαγαζι στο Κολωνακι και να ΑΡΝΟΥΝΤΑΙ να τις εξυπηρετησουν. Εγώ το 2009 έζησα το απολυτως αντιθετο στη Φλωρεντια. Μετα απο μία πολυυυ κουραστικη μερα με τη μαμα, πετυχαμε το μαγαζι του Ferragamo, το πρωτο μαγαζι που ανοιξε εβερ, ακριβως πανω απο το Μουσειο του. Και σκεφτηκαμε "ε δε μπαινουμε μεσα να γελασουμε;". Και μπηκαμε. Μας υποδεχτηκαν τοσο φιλοξενα, μας κερασαν σαμπανια, δοκιμασαμε παπουτσια που ΟΙ ΙΔΙΟΙ ΜΑΣ ΕΒΑΛΑΝ ΣΤΑ (ιδρωμενα απο το περπατημα) ποδια μας και τελικα ηταν τοσο καλοι οι πωλητες που αγορασαμε ενα ζευγαρι παρ' όλο που δεν μας περισσευαν τα 400 ευρουλακια. Τέλειο κείμενο, τέλεια παραδείγματα.. Ό,τι καλύτερο έχω διαβάσει εδώ και καιρό! Σε άλλα νέα: μας έλειψες Lopi, welcome back! Firstly, I love your writing. That said, I now proceed to my example. Unfortunately it was in the UK, in a central MAnchester shopping centre, in a Topshop store. I was basically told that a mistake by a sales-person who charged me with an extra pair of men's shoes was my fault, and that I was trying to steal it without paying for it(!). Cue major fight with sales representatives and sales director. No, I didn't win, they insisted it wasn't the cashier's fault. I believe their attitude was due to the fact that I was foreign. Needless to say I have never entered a Topshop store again.